When I was a kid reading Skateboarder Magazine cover to cover I always wanted a Kanoa Flyaway helmet. I never wore a helmet but those always looked so cool. In fact the only time I wore one was the few times I skated the two short lived skate parks in the area and that was a rental. It wasn't until the mid 80's that I finally got my first one but it was black with white pin stripes, not the super cool metal flake ones like they had in the 70's. And I think by then the company had changed hands although it still had the more angular shape. I did many searches on line in the late 90's and around 2001 or so tracked down a distributor that had a few left. But these were the plastic models that had the more rounded shape. But since they were only $15 I took them. Later on of course you could bid on Ebay for a used one but not being sure if it would fit it seemed unwise to pay those kinds of prices. 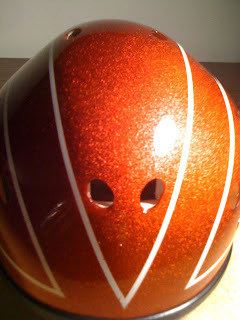 A couple of years ago Concrete Disciples did a review http://www.concretedisciples.com/cd_articles/cd_articles2.php?article=565 of a new version of the Kanoa Flyaway helmet that was being handmade by a guy in Santa Monica. But even though they looked great the price at around $200 seemed kind of high for a helmet. But after a few months I decided that since I had always wanted one and I could get a custom color that I might as well splurge and get one. I tracked down the number for Marshall Von Wolf via Bulldog Skates and then to his website, http://kanoasurf.com/. This is the helmet I got and I love it, very light and with much better air ventilation than my mid 80's model. If you want to buy one already made they are on the website and you can also get them through tailtap.com. If you're going to have to wear a helmet or if you always wear one any way you might as well look cool. At least in my opinion these look much better than any of the plastic ones you see today. Sure, they cost a lot more but they are hand made out of fiberglass and as I said you can get custom colors. Plus when I met up with Marshall recently at the Venice park he informed me that he will replace the pads when they eventually wear out as well.